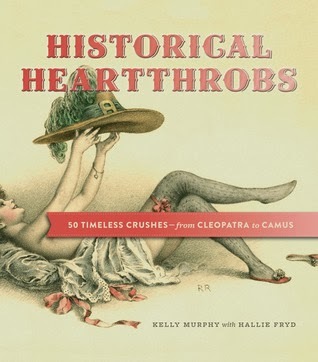 Historical Heartthrobs by Kelly Murphy and Hallie Fryd : Review and Giveaway! This book compiles photos and life stories of 50 of the sexiest men and women from history and asks the essential question: Would you really want to date them? Some are artists, some are scientists, and many are political or military leaders, but all have had a lasting impact on human life—and a sizable impact on their admirers as well. Each entry describes the period in which the heartthrob lived and includes essential stats, hilarious sidebars, and, of course, a “crushability” ranking: a measurement of how crush-worthy these people really are, based on their relative levels of heroism (or villainy). Ready for Valentine's Day? You might be missing the perfect book for the occasion if you overlook Historical Heartthrobs! I love how this book taught me more factual knowledge about historical figures I already know and introduced me to more historical figures I was not yet aware of. The little tidbits of their lives and some specific tidbits created quite the interesting story behind these grand figures. I liked how the author portrayed them more as friends than as people to be feared or thought of as unattainable. The personalized history made me really remember what went on in these peoples' lives and, more specifically, their love lives. The quotes were memorable and I loves the hotness scale. This book is certainly meant for young adults, but I think adults would love this book as well! Born and raised among the sprawling cornfields of rural Pennsylvania, Kelly Murphy now writes from her child-sized apartment in Crown Heights, Brooklyn. Her articles have appeared in Brokelyn, Brooklyn Based, Chic Today, NCTE’s The Council Chronicle, and various other publications. A Penn State graduate, Kelly currently works in publishing. Hallie Fryd is the author of Scandalous! : 50 Shocking Events You Should Know About (So You Can Impress Your Friends), which was aForeword Reviews Book of the Year Winner in 2012.
a Rafflecopter giveaway This product or book may have been distributed for review, this in no way affects my opinions or reviews. I would like to see Jackie Kennedy Onassis. I would like to Thomas Jefferson in it.